Whilst books about Rastamouse were introduced in 2005, it wasn't until January 2011 that CBeebies launched a 26 episode series designed to appeal to kids under six years old. 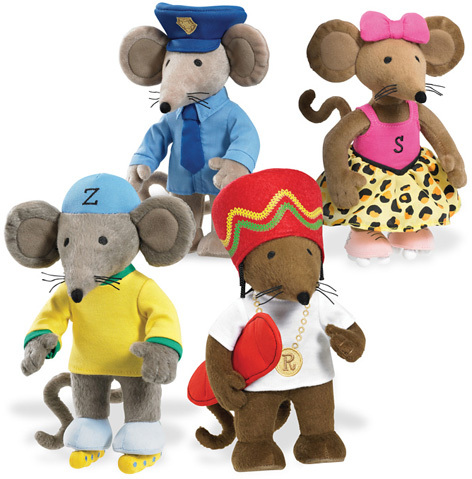 In early 2011 Character Options won the rights to produce Rastamouse plush toys featuring most of the popular characters in Da Easy Crew. Plastic figurines and playsets are expected to follow. The Scratchy and Rastamouse soft toys are particularly cuddly, although it's hard not to love Zoomer and Wensley Dale too. The best thing about the feature plush toys however, are the built-in sounds that you can guarantee kids will be copying up and down the land! MV Sports is on board as the wheeled toy supplier for Rastamouse and is expected to release a wide range of products including skates, scooters and skateboards. Featuring the reggae band made up completely of mouse characters, Rastamouse himself wears dreadlocks and a typical Rasta Tam Caribbean woolly hat – and not forgetting his favourite skateboard means of transport. With a problem solving theme throughout, Rastamouse is joined by Scratchy, Zoomer and President Wensley Dale. These major characters will feature in any Rastamouse toys, as well as Bandalu the Cook and Bagga-T who runs the local orphanage. The fact that the patois-speaking puppet doesn't speak the Queen's English has lead to a rather bizarre "racism" debate going on in some corners of the press. Children however, can't get enough of this little guy... and who can blame them?